a beautiful place to live, with historic buildings, green spaces and many activities. a city of nostalgia – the areas around the colleges are crowded with tourists, tour guides and punt touts. a diverse city – from very old architecture to modern buildings and shopping arcades mixed together in the centre , and a lot of quite ugly buildings outside. city of excluded spaces, class distinctions and snobbery. The University dominates parts of the city centre during term time. Lots of hopeful – and on occasion arrogant – students in their own world. But – as per the project instructions – I also wanted something that might contrast with the meaning and style of the painterly landscape ‘waiting’ for the rush of students. So again something still, without people. A ‘fairy-tale city’ looking backwards instead of forwards. I did some sketches of the corner by the Round Church because it had a mix of architecture: the Victorian-style ‘Original Sweetshop’ and Tudor St John’s College, and it was not too difficult to sit undisturbed on a bench in winter time. Leaving some other ideas I had for Project 1.3 Landscape Composition and Assignment 5. There were many different print media and styles I could have used – impressionist monoprints focusing on light, lithography focusing on tonal and marks, linocut or collagraph focusing on shape contrasts. But I already had in mind an etching where linear cross-hatching imitating traditional ink drawing for the historic architecture. A theme park city stuck in straight-line time. Also to again extend my skills beyond what I had done for Printmaking 1. The monochrome hard-ground etching was reasonably successful for my first attempt at etching. The sharp mechanical lines and the square format capture quite well the sense of straight-laced cramped claustrophobia one often feels in Cambridge – despite the architectural elegance. The aquatints with their murky mistiness and potential for grunge also offer some interesting possibilities for future development. But this project threw up far more ideas than I had time for. Exploring the very many urban landscape possibilities in Cambridge will be an important part of my practice going forward – looking much more at Cambridge life and its many contradictions and ironies rather than just aesthetics. I started by looking back through some of my old sketches – for ideas and also to do something new. I also started to think about what characterises urban as opposed to natural landscapes using some of the ink marks from cleaning rollers and plates. Lowry’s images of people and streets in the North of England like lives frozen in time. All of these ideas point to many possibilities for future exploration. But I decided to go with my original idea of the traditional architecture and etching – partly also because it meant I could take advantage of an etching workshop with David Borrington at Curwen Study Centre to explore different types of mark-making with different etching techniques. And extend my skills – as I had not done etching before. I decided to focus on the view through to St John’s college from the Round Church corner because of the interesting contrast of architecture and styles between the 19th century? sweet shop and the Tudor-style college. I made a series of quick pencil sketches. I could have spent longer on this, but already had an image in my mind. I was also having problems drawing outside in the very cold weather and it was affecting my RSI. I took some photos for reference. I knew in advance the dimensions of the etching plates at the course and prepared a square sketch and tracing. I decided to just use St John’s and the Original sweetshop, but wanted to soften the frame on the right with some bare tree branches from the tree next to where I had been sitting. The hardground etching process was fairly straightforward – though as with other intaglio and relief processes it is a bit nerve-racking not being able to easily correct mistakes. It was also clear that I needed to practice basic pen and ink drawing more to get more subtlety and expression through cross-hatching. Following Rembrandt, I also experimented with different thicknesses of ink. I also tried two colour inking to see if I could capture the winter light. Colour etching 2 is OK and I find the contrast in ink styles in etching 3 could have possibilities to explore further. But they do not reflect the hard traditional feel I was looking for. The most successful in terms of impact and tonal contrast is monochrome etching 1. The square format captures quite well the sense of cramped flat claustrophobia one often feels in Cambridge – despite the architectural elegance. I like the sketchy lines on the college arch – a bit like a fairy tale. St John’s College colour etching 1. St John’s College colour etching 2. St John’s College colour etching 3. The aquatints were much less successful because the length of etching is very difficult to control.. But I found the foggy effect in aquatint 1 potentially interesting for its blankness and empty space – a feeling of cocooned isolation in city life. 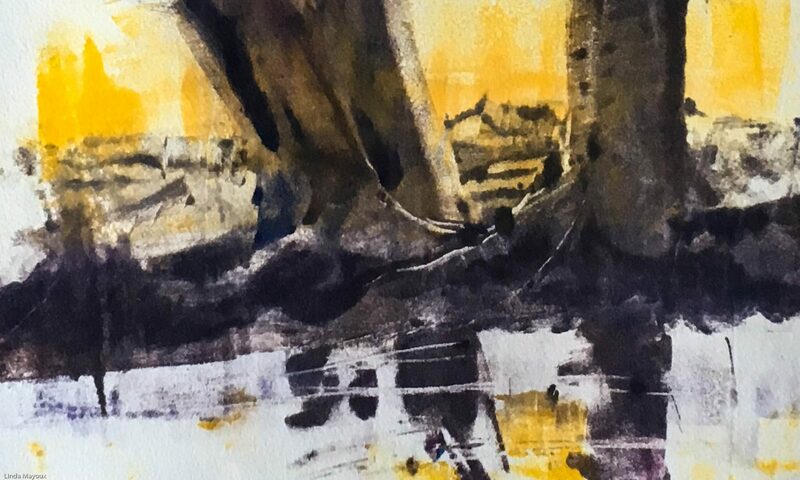 The green aquatint 2 was attempting to give a summer willow feel – weeping willows being a key feature of tourist Cambridge and explores the potential of combining aquatint with monoprint mark-making on the same plate. The digitally produced black and white editing of this image is more effective. I like the contrast between the light windows and dark building and background with the hint of anonymous figures. This approach merits further experimentation – but on a different image. St John’s college aquatint 1. St John’s college aquatint 2. St John’s college aquatint 2 black and white. I agonised over different titles I could give this image, to highlight the theme of a city frozen in time, looking back to a nostalgic dream past. But this project threw up far more ideas than I had time for. Exploring the very many urban landscape possibilities in Cambridge will be an important part of my practice going forward – looking much more at Cambridge life and its many contradictions and ironies rather than just aesthetics. For this particular image I decided to just call it what it is ‘St John’s’ and leave the rest to interpretation. Hi Jennifer, I live in Cambridge and am lucky enough to have access to Curwen Print Studios in Londonband Barnabas Press. I did the etching and lithography at workshops. Are you doing etching at home or do you have access to a studio local to you?